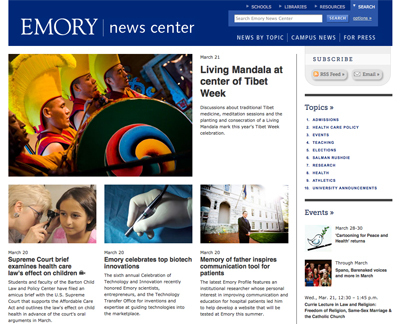 Project Description: Partnered with the Emory Marketing and Communications News team to architect the deployment of a new central news repository replacing multiple legacy websites and systems, incorporating large scale tagging, feeds generation, and utilizing Web Services to extend the CMS platform. This site was awarded two 2012 Interactive Media Awards for News and Education. The solution also was awarded a "Cassie" Award for Best New Site by the CMS product vendor, Hannon Hill.